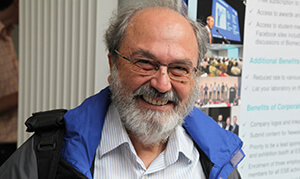 The organizers of the 14th International Conference on Nanosciences & Nanotechnologies decided to hold a special Workshop, within the Workshop on Nanomedicine, to pay tribute to Prof. Yannis Missirlis, retired (but still active) Professor of Biomechanics & Biomedical Engineering at University of Patras, Greece. The decision was based on his continuous multifaceted support of these Conferences from their start and, especially, for his being the pioneer of the Interdisciplinary Sciences of Biomechanics, Biomaterials, Biomedical and Tissue Engineering in Greece. The Workshop to honor Prof. Y. Missirlis will take place on Friday July 7th, during the NN17 Conference (Nanomedicine Workshop). In order to register for the Special Workshop, you can either Register for 1-Day-pass selecting NN option, or Register for the whole NN17 (Full Registration). ...or download the program in pdf.